"Where ever men have lived, there is a story to be told"
Joseph Bancroft, an Englishman trained in textile weaving in Lancashire, established his own cotton mill on the Brandywine in Wilmington, Delaware. Bancroft began manufacturing cotton cloth on March 25, 1831. 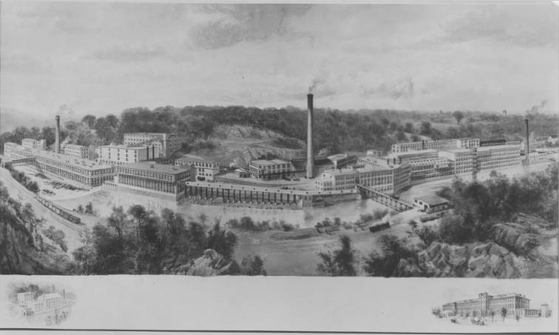 The mill, known as Joseph Bancroft & Sons Cotton Mill (sometimes referred to as Rockford Cotton Mills, Brandywine Cotton Mills or James Riddle & Sons Mills), was built in order to take advantage of the Brandywine River's water power and Bancroft adopted the traditional British spinning and weaving technology for use in his operation. The firm expanded steadily during the 1830s and 1840s as it began to produce cotton for both the Philadelphia and New York markets. In the late 1840s, Joseph Bancroft brought his two sons, William and Samuel, into the business assuring that the company would remain a family enterprise. During the Civil War, when the American market was largely closed to English imports, the Bancroft firm, like most other U.S. textile companies, prospered. After the war, the company developed a new bleaching process and began to concentrate on finishing cotton cloth. This operation became known as the Joseph Bancroft & Sons Company and was incorporated on October 1, 1889. The Bancroft Mills complex had the longest history of textile milling in the Brandywine Valley. The property was described in 1889 as the largest textile finishing plant in the United States. The business remained in the Bancroft family for 130 years. In the mid-1930s it began producing a line of rayon goods and a cotton finishing process that were marketed under the trade names of "Ban-Lon" and "Everglaze" respectively. The Banlon and Everglaze processes were widely licensed in Europe and America and by the early 1950s foreign royalties accounted for more than 70 percent of the firm's total profits. In 1961, the Bancroft Company became a division of Indian Head Mills, Inc. of New York City. The Joseph Bancroft & Sons Company sponsored the Miss America Pageant and promoted its fabrics through the Miss America Pageant from the years 1953 to 1967. Miss America modeled her official "Everglaze" and "Ban-Lon" wardrobe along other models, including those for men's and children's clothing. There were fashion shows featuring Miss America's "Everglaze" wardrobe and clothing created using McCall's patterns in fabrics by Everfast; displays of fashions and fabrics in department stores; and the use of "Everglaze" and "Ban-Lon" fabrics for household furnishings such as draperies, upholstery, and bedding. Joseph Bancroft & Sons Company became a wholly-owned subsidiary of Indian Head Mills, Inc. of Massachusetts in September 1961. With continued erosion of the Northeastern textile industry, the plant became increasingly unprofitable. Indian Head Mills, Inc. became a conglomerate called Indian Head Inc. in 1966, and the finishing plant was put up for sale in 1972. It was purchased by the Wilmington Finishing Company, composed mostly of Bancroft department heads, on June 4, 1973. Indian Head Inc. sold the Joseph Bancroft & Sons Company, which by now was reduced to the licensing operation, to Beaunit Corporation in February 1975. The Rockford factory closed in 1981. Bancroft Mills Condominium is a restoration and adaptive reuse of two nineteenth century textile mill buildings. The restoration created 46 condominium units. The original part of our building was a three story stone building at the west end of the present structure which was built in 1848. Sometime before 1888, the building was lengthened to its present size and additional story added on top. Because of the architectural significance and its importance to the development of both the American textile industry and the City of Wilmington, Bancroft Mills has earned its place in history. In 1984 Bancroft Mills was nominated to the National Register of Historic Buildings.